Rooftop Run is the eighth level in Sonic Generations, and an adaptation of the level Rooftop Run seen in Sonic Unleashed. This level gets reborn into a sort of carnival, with balloons, confetti, and various festive decorations throughout the city. Modern runs through the city like last time, running on the orange-roofed buildings and along the ruins throughout the city. Along with the famous grinding down the clocktower, other familiar areas use Quick Steps and Sonic Drifts like the original level. At the end of the stage he will not only fight off Aero-Chasers, but he will also take on a flying battleship shooting huge lasers. 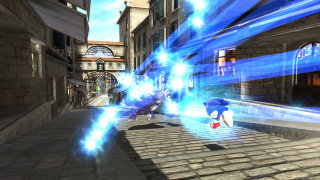 Going Super Sonic should not be done in the Aero-Chaser part as when Super Sonic runs out Sonic will likely run into an Egg Lancer. 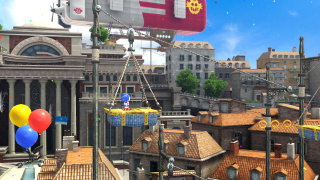 Classic Sonic takes a more platforming approach, traveling along rooftops as well but also traveling under the city, which has elements from the Werehog stages like the barrels. Near the end he ascends the clocktower through platforming and smashes the flying blimp with the clock face. After finishing the stage, the Sonics free Vector the Crocodile, who has a hunch that something or someone is controlling the Time Eater. He will say this regardless of which Sonic rescues him. Aero-Cannon - Fire shots when in range. Aero-Chaser - Flying robots that fire lasers. Egg Fighter - Eggman's newest basic robot model. Egg Lancer - A Egg Fighter with a lance to strike. This page was last edited on 5 March 2018, at 20:57.